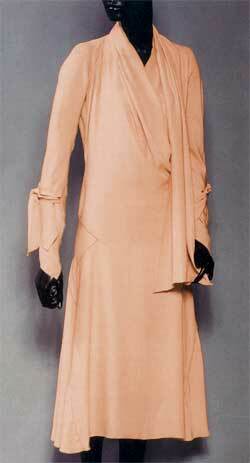 I remember when I first saw a dress by Madeleine Vionnet. I was walking through the galleries at the Costume Institute of The Metropolitan Museum of Art, having returned to work after vacation. I found a few mannequins dressed for the upcoming 1973-74 exhibition, Inventive Clothing, 1909-1939. An evening gown with a skirt hem high in the front and low in the back caught my eye. "Oh," I said to my boss, the late Elizabeth Lawrence, who was dressing the mannequins, "that is copied from Balenciaga!" "Afraid not," she said, "Vionnet did it first." Examining the dress further, I found little self-roses around the neckline, a halter neck, a wrapped-waist the dress could have been worn out that very evening. It was dated 1917. I had to know more about this designer. In the library I read that she was born in 1876 and by age 13 was apprenticed to a dressmaker in a suburb of Paris. She advanced quickly and by her mid-teens had found a job in a Parisian house. In her late teens, she went to work in London for a dressmaker, Kate Reilly, who bought models each season from the French couture. Vionnet copied patterns from these garments and supervised making dresses in the current styles for individual clients. 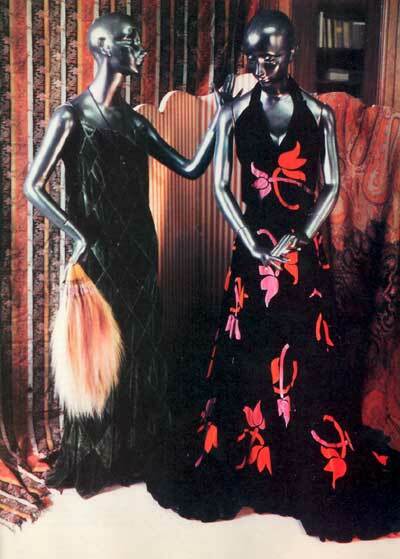 When Vionnet returned home to Paris, she chose to work for the Callot Soeurs. She was assigned to work under one of the sisters, Mme. Gerber, who was responsible for the new models of the house. She stayed here for five years, refining her craftsmanship in cutting, fitting, and sewing dresses, until she was engaged by the head of the House of Doucet to create new models for his clients. She left Doucet in 1912 to open her own house. Possibly due to the onset of World War I, the house closed in 1914. After the war, Vionnet reopened in the same place. Acceptance was there. By the early '20s, American clients were as numerous as the Europeans. She soon moved to larger quarters on Avenue Montaigne, where her work force grew to 1,200. She retired in 1939. Her most notable contributions were her bias cuts, halter necks, and dresses that slipped over the head. She worked out these ideas on a wooden doll. That is what the history books have to say about Madeleine Vionnet. Upon examining more of her work, I saw clothing construction completely different from that of the other designers in the exhibition, all members of the French haute couture, and different from anything I had experienced as a garment designer and manufacturer. In each piece I discovered another way in which a garment could be put together, whether it was the shape of the pattern parts, the manipulation of the fabric for decoration and shaping, or the complete adherence to the principles of dressmaking. Everything was thought through to the smallest detail. Everything was precise. The literal translation of haute couture is "high-class sewing." What was sewn were dresses, copies of the original seasonal models that each house presented, made to order and to fit the individual client. Producing an original model is accomplished in three steps: conception and planning (sketching and draping), interpretation (pattern making), and execution (cutting, fitting, seaming, and finishing). At the Callot Soeurs and other couture houses in 1907 a new model was conceived improvisationally - the final fabric or a muslin was draped on a live mannequin. Draping was extemporaneous, not the formulaic system that the fashion industry thinks of as draping today. Pattern making, the next step, was most often accomplished by the head dressmaker, the premiere. At the Callot Soeurs, after Mme. Gerber draped her ideas on a live mannequin, Vionnet, as premiere, would have in turn been responsible for making the first pattern. It is logical that Vionnet used both drafting and draping methods in interpreting Mme. Gerber's designs. Drafting a pattern is often referred to as flat pattern making because a pattern is constructed on paper, using the measurements of the body. Flat pattern making has been the main method of making patterns for centuries. Basically, the body is divided into four parts, and a shape is made to correspond to each part: front and back bodices and front and back skirts, plus a fitted ; sleeve. Darts are used under the bust and above the hips to fit the bodice into the waist, and above the shoulder blade in the back to fit the cloth into the neck or shoulders. Once put into muslin, the fit can be checked against a dress form or body. From this sloper, various cuts can be produced. Draping suggests manipulation of the cloth, placing muslin (or toile) on a dress form, pinning in or cutting away excess cloth to acquire fit, and adding cloth to embellish some part of the body. Draping probably originated so that cloth could be manipulated into configurations that couldn't be achieved through drafting. Today, the planning of an original model is almost exclusively done by sketching, and the interpretation by drafting or draping recipes. That is somewhat how I was trained and how most of us at the Costume Institute viewed the construction of clothing. Vionnet didn't work like this when she draped on her wooden doll, and therein lay the mysteries we were encountering. Vionnet's halter necks, wrapped waists, and circular skirts are easily recognizable cuts. Vionnet also manipulated fabric. The twist often re- places a dart, especially in the bust area. It functions both structurally and aesthetically, holding in excess material that would otherwise have to be stitched and cut away. A feature of the twist is that there will be fullness at both sides of the turn. In the midriff bodice (right), after sufficient fabric was draped over one breast, the fabric was twisted once spirally, which held it in and released it where it was needed to cover the other breast. For the dress at left on the facing page, Vionnet used a twist at the shoulder. Normally, a dart would have been used from the shoulder down both the front and back. Vionnet manipulated the fabric to remove the excess for fit and decoration at the same time. With a little examination, it was easy to identify those of Vionnet's dresses that were on the bias. Of course, Vionnet never invented the bias cut. If you look at dresses from the 19th century, you find pattern parts laid on the textile at an oblique angle, to be cut, sewn, and hung on the body on the bias. Vionnet was very upset at being designated the inventor of that cut. She never claimed for herself that place in history, only the expansion of its use. I remember bias cuts being worn in the late '30s, when I was very young. It was not a cut I admired-the garment hugging the body to the point of distraction so every imperfection was emphasized, bubbly seams that never laid flat. I suspect now that that was due mostly to Vionnet's poor imitators. Vionnet's bias cuts were different. I wanted to know how Vionnet had mastered the cut and hang of the bias, but that would have to wait. With the deadline of the approaching opening, all attention was on preparing, dressing, and placing the mannequins. The sole luxury allowed was to note the choice of seams, facings, hems, and stitches, and to admire Vionnet's work. The seams Vionnet chose could be the usual overcast seams seen in most dresses of the haute couture. The green dress of velvet patchwork at the top of this article demonstrated that to the extreme. Seams for all 153 parts were opened and overcast, as were all neck and hem edges, and a flat gold thread was couched over the seams on the right side. The same treatment was given to the edges. Vionnet stated in a post-opening interview that one reason she started to use bias was that it possessed an inherent stretchability. By making dresses that could be put on over the head, she created garments that were both easy to get into and out of and comfortable to wear. This anticipated the functional quality we find in knits today. Once into the use of bias as a stretchable medium, there would be problems to solve on both sides of the spectrum. When she didn't want the stretching to occur, what should she do? When she wanted it to occur, what solutions would she devise? 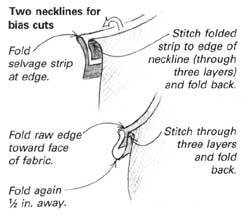 Generally, when curved seams are opened, the seam allowance won't lie flat when pressed back. If the allowance is convex, the outer edge is longer than the seamline and will tend to ripple and be bulky. If the allowance is concave, the shorter edge prevents the allowance from lying flat by holding it in. If the edge of the allowance is stitched, whether by machine or hand, that, too, will hold in the edge of the seam. There are solutions to this problem. A narrow seam lessens the difference in the lengths of the edge and the seamline. Slashing the allowance sufficiently, as close to the seamline as possible, permits the edge to open, thus correcting the difference in lengths. A third choice is to eliminate stitching at the edge. 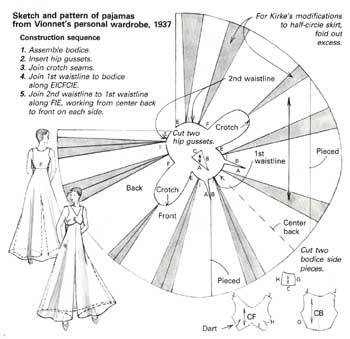 Vionnet used all these methods. Because she worked so many parts and seams on the bias, she had additional problems of allowing the stretch to be at its optimum. On one coat, intended to hug the hip area, the seams were heavily slashed, and there was no overcasting stitch at the edges of the allowance - not a finish one would ordinarily, attribute to a haute couture garment. There were other considerations when hanging the cloth against the body on the bias. Because each fabric, by its fiber and weave, is going to react a little differently, Vionnet's dresses were not lined. If they were sheer, a separate lining or slip was supplied, and each part was allowed to go its own way. Coat linings were attached only to the neckline and the front facing of the opening. Often jackets had no lining. Necklines cut on the bias presented another problem. 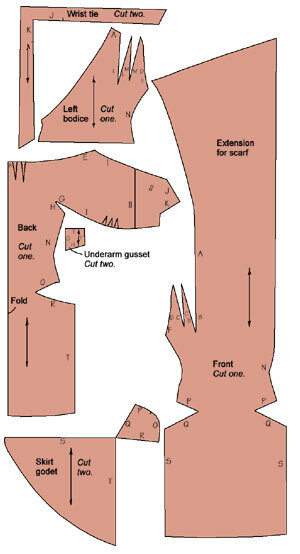 On a dress with slightly dropped shoulders, to prevent bias stretch at the finished edge, which was on the true bias, folded on-grain strips were stitched to each neck edge and turned back, as shown in the drawing left. The selvage was intact, so there was no need for clean seaming, making the edge thin and flat, while controlling the neckline stretch. Another neckline, the concave edge of a circular cut, was slightly scooped in front and back. It was not necessary to add a part; the solution was inherent in the cut. It works on the same principle as the concave seam allowances. The edge will be shorter than any seamline placed within the part and will thus prevent any stretching of the finished neckline Vionnet simply folded the raw edge twice, as shown in the drawing, hiding it inside the second fold, on the reverse. Only a narrow edge shows to finish the neckline. Vionnet overcast and turned up edges for many hems, even if the cut was bias. For circular cuts and sheer fabrics, she usually resorted to picoted or rolled hems. The hem on the dress at right, a circular cut made in eyelet, demonstrates Vionnet's care for finding solutions that considered problems of both structure and aesthetics. Rather than turn back the hem, which would have caused an uneven intrusion into the pattern1 of the eyelet because of the circular cut, Vionnet cut the eyelet at the hemline. Now she had one layer of uneven eyelet pattern. The resolve for this was again both functional and aesthetic. A buttonhole chain stitch secured each loose end of the eyelet motifs, simultaneously creating an even finish line for the hem. When the exhibition opened, none of the clothes on view could be touched. My intention to research beyond seams, facings, hems, and stitching commenced nonetheless. After researching published material, I started to take patterns from other pieces. The following year I went to England and France for more research. I subsequently made several trips to France, gathering information and taking patterns. I was fortunate to have met Vionnet on my first trip, as she died in early 1975. I visited her twice. She wasn't in good health; we arrived two days after her 98th birthday. I had to promise not to ask her any technical questions, as she couldn't always think of the answers. This she found upsetting. She had just received photos from the exhibition. The second condition of my visit, that I'd limit it to 20 minutes, was soon forgotten in discussion and explanations. I told her of my intention to study her techniques and possibly publish them in book form. She was pleased, as she had always wanted to do this herself, but of course, it was now too late. Vionnet had her housekeeper, Solange Lerond, bring me some of her personal clothing. Solange brought some evening gowns and a box of pieces from the early '20s. Vionnet then decided that I should try on each piece. I was hesitant, as the one time she stood, Vionnet fit well under my chin. Then, too, there were my broad shoulders. I had completely forgotten about the bias cut. The clothes stretched to fit around my body, although they were too short. Vionnet told me I could take whatever I wanted to copy. I selected two evening gowns from which to make patterns. One is the pajama skirt in the sketch below. By taking patterns, I hoped that I would be able to understand and dispel some of the mysteries that Vionnet's cuts posed. As Elizabeth Lawrence often said, "To understand a designer, you have to get into his mind; to understand a dress, you must allow it to tell you what it is all about." The easiest way to take a pattern from an existing garment is to take it apart, lay the pieces flat, and draw around them. The next easiest way, when a garment can't be taken apart, is to do a rub-off. In this method, another fabric, generally unbleached muslin, is laid over and pinned to each part, one at a time, with the grain of the overlay fabric carefully aligned to that of the part being copied. With tailor's chalk, the seams and darts are then rubbed every inch with horizontal strokes. The chalk marks register the difference in the texture of the seam and the weave of the fabric beneath, making the seamline clearly discernible. Neither of these methods could be applied to a museum object, especially by one who is a conservator of textiles and costumes. There was another consideration. Since there would be so many pieces cut on the bias, and since there would likely be deformations of the weft and warp grid because of the bias stretching, I chose a system that would address that problem as well. The theory behind the method is that all textiles start as a width of rectangular fabric. Within this shape, warp yarns of equal length lie in one direction, and perpendicular to them lie weft yarns of equal length. In making pattern parts, some of these yarns are cut away. If a part has had a great deal of shaping, there are many curves to be determined. Therefore, if one yarn is selected as home base, yarns perpendicular to it can be measured, and the lengths from home base to the edge can be recorded. Not every yarn has to be measured - only enough so that a fairly accurate cutting line is established. Luckily, the first patterns I took were of Vionnet's earlier designs. They were sometimes unorthodox, although simple in construction: a rectangular shape, cut and sew on the grain, but hung, when assembled, on the bias. Her adherence to cutting and sewing on the grain of the fabric as much as possible helped keep her bias cuts out of the category of unattractive memories. For these pieces, graph paper is sufficient for drawing the pattern. Measurements taken off the parts of the dress must be scaled to some predetermined ratio that will relate to the grid of the graph paper. It's easiest to equate one square to 1 in. or 1 cm. For the most part, however, I transferred the pattern parts from the dresses to dotted marking paper. Marking paper is used by garment manufacturers in laying out pattern parts of different sizes so they can fit the width of a particular fabric as a preliminary step before cutting in mass production. It is dotted so that all three directions of the fabric - warp, weft, and true bias - are marked, the former two, every inch. It eliminates the need for scaling. Being able to transfer the pattern parts full size was particularly useful in recording those cuts that were still an enigma to me. In taking a pattern of Vionnet's circular cut skirts, where fabric has been cut away at the hem and waistline, the lengths of the yarns in both directions must be measured. Because the skirts were generally much wider than the fabric in which they were made, the fabric was pieced on grain. I found taking measurements off the piecing seamline a good place to start. I drew a line corresponding to the seam length on the dotted paper. Then, about every 2 in. along the pieced line, I measured the length of a particular perpendicular yarn to the hem edge or waistline seam and marked the dotted paper accordingly until there were sufficient marks so a hemline and a waistline could be draped with the aid of a curved ruler, as shown below. 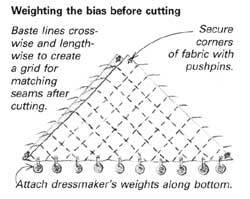 If the piecing won't allow perpendicular measurements to give the entire hemline or waistline, then one of the perpendicular lines must be selected to strike off again, in a direction parallel to the first seamline. This method can be applied to the most complicated pattern parts, if one works slowly and figures out what yarn as home base will best lead to the edge. By the time I had taken a few dozen patterns from Vionnet's dresses, I had included, besides circular and simple geometrical shapes, bias and traditional shapes, along with such manipulations of the cloth as twists. There were also slashes and parts like gussets and godets. The slash was often, but not always, found with insets, such as the gussets and godets. It was clear what purpose the slash served with godets: to add more cloth, more fullness, at a specific area of the body. It was not yet clear what use Vionnet intended for the gussets. At this point I had to admit that not all my questions about the construction of Vionnet's dresses had been answered. Mysteries remained, particularly concerning circular cuts, which I had first-hand experience in manufacturing. We would cut and seam circular skirts, then put them on a dress form so the bias skirt could do its stretching before the hemline was determined. This "hang-out" period was at least 48 hours. After completing the dresses and shipping them to the stores, we advised buyers that they were best stored flat for a long period. I knew that in time there would be more stretching, resulting in a skirt with an uneven hem. Vionnet's circular-cut skirts hadn't hung out unevenly, some not in 50 years. Perhaps this was due to some of the anomalies I'd found in taking patterns of these cuts. Some weren't on true bias center front and center back. The pieces weren't always cut symmetrically, and one side might be slashed with a gusset added, while nothing was done to the other side. I didn't know why, but I had a clue. I had read in one of the periodicals how beautiful Vionnet's circular skirts were with their ripples always equal in size and fullness at the hemline. At this point, we were packing the exhibition for Kyoto, Japan. I was to be part of the installation crew. Of course, I needed clothes, especially for the opening night and final party. I decided to make a circular-cut skirt of two quarter circles, for front and back. Rather than draft the pattern, I draped it, keeping in mind that the final garment should have even ripples at the hem. I placed the lengthwise grain, the selvage side, down the right side, pinning a point at the waist. I then cut away and dropped, stretched, or eased along the waist until a waistline was established, making sure each ripple I created at the hem appeared even with the preceding one (right photo, above). When I got to the left side, I found I had not yet reached the weft grain. Since I had what I wanted in even hem ripples, I cut away the excess fabric. I repeated the procedure when I draped the back. This time, there was much less left over, confirming what I had found - that pattern parts weren't always on the true bias, nor were they always symmetrical. It also helped explain why, in some dresses with a waist seam and two-piece bias-cut skirt, one side of the waistline was cut a little deeper. To fit a quarter circle to the waist, the apex has to be cut away, not straight across, but in a concave curve. In drafting this pattern, the curve would be drawn equidistant from the apex. The response of the fabric when hung along this curved edge, however , is not equal. On one side, the fabric will hang from warp yarns, which won't stretch at all. On the opposite side, it will hang from weft yarns, which will stretch little or much, depending on the weave and yarn structure. The central area will hang on the bias and stretch a lot. The very center, on the true bias, will stretch the most. To control the ripples at the hemline, one must control the amount of fabric stretching into and collapsing under each point of the waistline above. The fabric must be cut and placed along the waistline according to its stretchability at each point. The warp grain side will be cut deeper than the weft side, and the bias, with the most ability to stretch, must be restrained from doing too much. At the true bias, I stretch the fabric horizontally and force some of the fabric into the area of less stretchability. Theoretically, each ripple will then have the same number of yarns, the same weight, and the same degree of stretching. The even hemline should persist. I made this skirt in 1975. I've had it on a hanger ever since, just to see if it will develop an uneven hemline. It has not yet hung out. My conclusion is that in draping this way, evenly distributing weft and warp yarns in each ripple, if there is hang-out, each ripple is going to hang out equally. I was to learn much later, from one of Vionnet's employees, that Vionnet had also devised methods of controlling the bias before it was cut and sewn. She weighted the bias with lead dressmaking weights, hanging the fabric on the wall, as shown In the drawing (left). A corner of the fabric was secured to the wall; then the remainder was spread in a flat triangle, with heavy dressmaking weights attached along the bottom. Longer fabric was looped and folded back up so two layers could be weighted at the same time. In her designs that were cut on the bias, and many were derived from traditional pattern parts, Vionnet prepared all the fabric with the weighting treatment. In addition, to have more control of the hang and fit, she basted crosswise and lengthwise lines on the cloth at equal intervals to create a grid. The grid was used to match sides of symmetrically cut bias parts to one another for assembly. My second garment for the Kyoto trip was to be a modified version of Vionnet's personal pajama dress. The pattern called for a three-quarter circle. I had a piece of black silk shantung that was left over from the shirt I was planning to wear with the pajamas. One modification would be to cut the pants at the natural waist. And, since the shantung would be of a stiffer hand than the crepe that Vionnet used, the other modification was to reduce the fullness at the hem. I decided to remove this fullness by converting the three-quarter circle into a half-circle by folding equally sized and placed darts out the paper pattern from hemline to waist and crotch (shaded areas in the drawing above). Since I was in a rush, I skipped what a good dressmaker would have done - try out the new shape in muslin before cutting the shantung. When I tried the pants on after having sewn the crotch seams, I was heart- broken. All the ripples were in the back. The hemline at the front was flat. It wasn't at all what I had visualized. I don't know why I did what I did next, whether it was out of anger, frustration, or divine inspiration. I took the scissors and slashed from the waist down about 3 in. on the grain at the center of each side in front. When I pulled open the slashed area, I had ripples at the hemline. I then filled in each area with a triangular gusset. I love these pants and wear them often. More important, one of the uses of the gusset was at last known to me, and this in itself was a clue to other, still unsolved mysteries of Vionnet's cuts. Sometime after returning from Japan, I found a doll almost exactly like the one used by Vionnet. With a good, healthy doubling of the measurements, the patterns draped on this doll fit me fine. Now I could have first-hand experience in draping the styles that most interested me. Having a articulated form made achieving graceful fitting sleeves possible; having one this size allowed me to see instantly the whole of each concept. When draping on a full-size dress form, I always have to step back to see the entire toile that I'm draping. In draping the Vionnet dresses on the doll, another theory for the use of the gussets had surfaced. 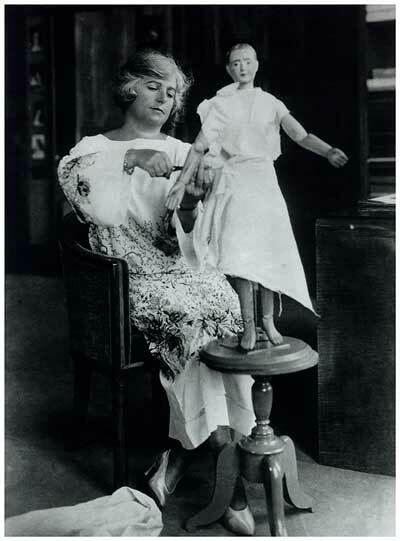 The doll was made to the exaggerated female shape fashionable in Vionnet's time. Vionnet's garments of the '30s fit close to the body. The theory was that when cloth has been slashed and spread and a gusset has been inserted, it changes from two- to three-dimensional, becoming a virtual sphere. If you think of the upper and lower hip areas, and the bust, you'll see that this is so. When I started to drape, intending to verify my theory, it didn't quite work. After much frustration, I realized that I'd been thinking of the body only as convex spheres. There's one huge concavity to be dealt with: the waist. I don't know why it took me so long to see that. Vionnet had many gussets at the waist. They're the easiest to drape. Back when I was doing research through the periodicals, I ran into an expression that mystified me. 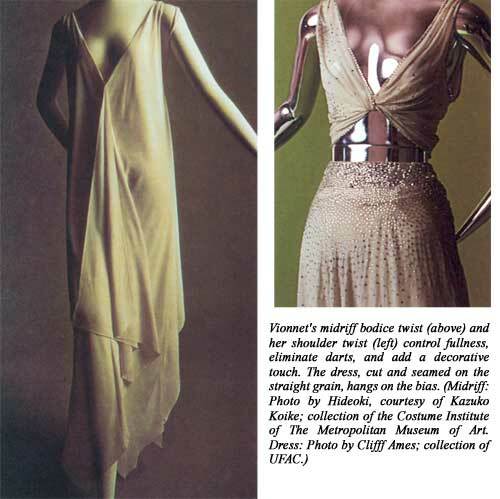 The journalist referred to Vionnet's dresses as "anatomical cuts." Could anything be more anatomical than directly dealing with the convex and concave parts of a woman's body? Add to it the use of bias for stretch, the advantages of circular cuts, the twist, and all the dress-making considerations. I've worn all the clothes that I duplicated and modified. They move better and fit better than anything else I wear. They are, in addition, timeless and elegant. From this research and my experience in copying, adapting, and draping the work of Vionnet, I've come to realize how simple and logical her choices are, from the shapes of the pattern parts to the manipulations of the fabric and the precise execution. Certainly these are marks of an excellent dressmaker. I understand now, especially after draping on my wooden doll, that Vionnet couldn't have planned any of the concepts other than by draping. The pattern parts could never have been drafted. The way the fabric was laid against the doll and later hung away from the body dictated many of the choices that Vionnet made in her use of the bias and the slash with its gussets and gores. As she had said, "You have to know the obedience of the fabric." Certainly this was a mark of an excellent technician. Vionnet insisted on referring to herself as a dressmaker. That is how she described herself when I visited her. The former employees I met always cringed when I would refer to her as a designer. "No," they would say, "she was a technician." Obviously, Vionnet was more. As a dressmaker and technician, she brought into being something that had never existed before, a way of dividing the surface of the body. Then, through her imagination of how dresses could be made, she devised new pattern parts. This is being an artist. Madeleine Vionnet was unquestionably a dressmaker extraordinaire.